Previous visitors to our blog may remember the post about our lighting choices. I was reminded this weekend that my least favorite thing about CFL light bulbs is that they contain mercury, a toxic element know to cause brain damage (Mad Hatter disease) but also kidney and lung disease in humans, not to mention the effects on the environment. Granted, each CFL bulb only contains a very small amount of mercury (about 4 milligrams) but that is still a toxic substance that I would prefer not to have released into my bedroom. Unfortunately, that is exactly what happened this past weekend. This desk lamp is obviously top-heavy and easy to knock over. I should have known better than to put a long CFL bulb in it, but, as they say, live and learn. As I was hurrying around this past weekend I accidentally knocked the lamp over, instantly breaking the bulb. Luckily, no one was hurt and the mess was contained to the top of the dresser, making for a relatively easy clean-up. So I cleaned up the busted bulb and put it out in the garage with the rest of our hazardous waste (rechargeable batteries, etc.) to await the next dump day. While we’re on the topic, the EPA also published the following chart. Here in the US, we are dumping over 100 metric TONS of mercury into the atmosphere every year! As it turns out, the single largest contributor to mercury emissions is coal-fired electric power plants. So, unless we are operating totally offgrid, we can draw a direct correlation from our electrical usage to mercury emissions. The more electricity we use, the more pollution gets dumped into the atmosphere. And opposite is also true: by using less electricity, pollution goes down. Ironic, isn’t it? 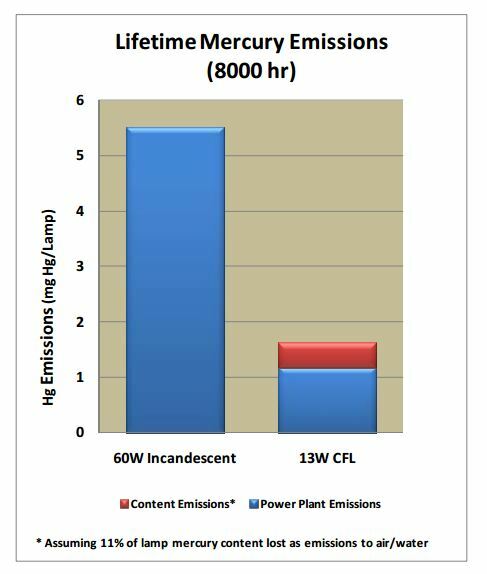 The CFL that contains mercury is actually reducing mercury emissions in the long run by operating more efficiently than the incandescent counterpart. Let’s just try to keep the mercury inside the CFL for now. At least until we upgrade to a LED bulb…. Yes. And potato chips, fingernail polish, diesel, Roundup(c), asbestos, smoke, dioxins, margarine and lead. Maybe we could find a cleaner planet. This one got messy.